We EcommerceKey accept payment via following methods so customers may use as per their convenient way. We mainly accept payments via PayPal, which is most secure payment gateway world over. You can pay by clicking on left PayPal logo. 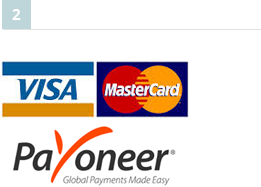 To make a credit card payment you will be forwarded to our electronic payments partner Payoneer. Payments are secured using the encrypted SSL protocol for transfer of confidential information from a client to the system for further processing. You can pay by clicking on left Master Card/Visa card logo's. ArrowSelect card and select card holder pays the fees. ArrowPlease proceed and pay the balance there.